A beauty alert for the woman of today, the perfect cat eye! Bored with the usual eye makeup? 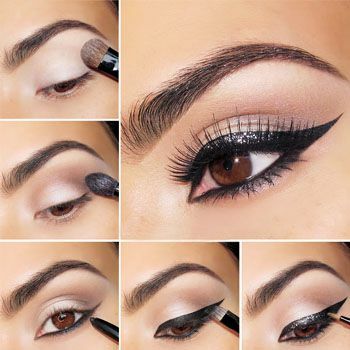 Wing your eye liner a little up to the corner of your eyes to give a glamorous look to your make up routine. Make your eyes innovative with the unique cat eye makeup within seconds. A word of caution: if you mess it up, don’t worry; with time and a little practice, you will learn it perfectly well. With various quick techniques to have a perfect cat eye is not a big deal now a days. There are various methods to do a perfect cat eye; it can be done with a liquid eye liner or with a tape as well. All you need to do is to get an eye shade that is a bit lighter than your skin tone for example the shade of light brown or any close one , you may use a highlighted colour. The second step would be to apply the shade in such a way that you make it go outwards according to the natural shape of your eyebrows. A shade with a darker tone should then be mixed with the former to give a neutral look to the colour of your eye lids. The next step is to draw a wing like shape somewhat like a triangle along your eye lid with eyeliner. By doing so, you make a corner between the lid and the lash line. Once you have made the wing fill it with a liquid eye liner. After completing these steps apply dark shaded mascara onto your eye lashes and a perfect cat eye is done in seconds!! This triangle trick is used for the purpose of giving a more discrete cat eye look to your eyes and prevents the line from being too thick. You can even make dots with a dry pencil close to the lid line and then join the dots with the liquid eye liner to make a perfect cat eye. There is another quick way of doing this eye makeup. You can make a template of cat eye make up with tape and stick it on your lower as well as upper eye lid. The particular space should be filled with a liquid eye liner to give it the required cat eye look and the tape should than be removed. The only drawback of this quick method is that it makes a very thick wing by using the template. for Day or for Night? Cat eye makeup can be done at day time and night time both. For wearing a cat eye look during day light all you need to do is to keep the tone a little lighter and apply a light creamy eye shadow on your eye lid. When it comes to night time you can extend the wing to look a bit longer and add more glamour to your eyes and add a dark shiny eye shadow on your eyes instead of the light one.